Mike Lanza, a serial entrepreneur with “way too many degrees from Stanford,” has stepped back from the start-up grind to, well, play. Raised in a Pittsburgh (Pennsylvania) suburb, Mike reports that he went outside to play everyday and had a boyhood free of play dates and other signs that today’s kids are over-scheduled, over-protected, and under-served when it comes to old-fashioned fun. 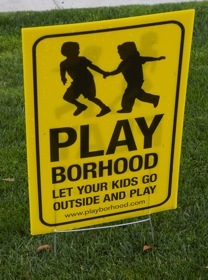 Through Playborhood.com, the father of two boys is working to raise awareness about how play has virtually disappeared from the lives of most American kids, and, by building a community of other concerned parents, bring it back. Intrigued about the idea? Mike will be hosting a Play Day and Parent Seminar on Saturday, May 1.